The travertine terraces of Pamukkale are the result of calcium carbonate (commonly found in the shells of marine organisms, snails, pearls, and eggshells) that has settled out of the natural spring water bubbling and the place has earned recognition as a UNESCO World Heritage site. The translation of "Pamuk-kale" is "Cotton-castle," if that gives you an idea of how large the formation is. We took an excursion there from Istanbul. You don't need to spend more than two full days or so there, but it's not hard to. Pamukkale is also an excellent alternative to Cappadocia if your kids are under 7 (because that's the minimum age for hot air balloons and horseback riding), because it's basically a natural water park connected to the Roman ruins of Hieropolis. We started the day at 3 am in Istanbul, having packed up our stuff after finishing dinner only a few hours earlier. The airport transfer picked us up on time at 3:30 am, and we were checked in and through security by 4:15 am. For our 6 am flight. So...what to do now? Fortunately, the bakery I stopped at on every trip to/from Adana was open and we got some pastries and milk. Or what I thought was milk, since I can't read Turkish. Well, that turned out to be a drinkable yogurt called "ayran." Which the girls didn't like. I feel that I should point out that the only reason we knew which gate to go to was because I had previously checked the one functioning departures monitor during the 5 minutes that it had been showing the flight info. The rest of the time, all screens showed the data feed as "Not found." That bodes well, right? We had breakfast at around 9 am and went back to the room for a couple hours to rest. A 3 am wake-up is tough for even the most seasoned travelers. An added bonus was that the weather improved from drizzly to sunny during our nap. We started up the travertine path around 11am, and the first thing that became immediately obvious is that we could have dressed better for the occasion. 1) Should have worn sandals. 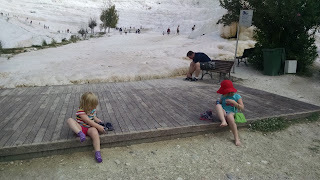 To prevent additional damage to the calcified travertine formation, no footwear is permitted on the white stuff (and much of the white stuff is completely off limits, even to foot traffic). So both adults carried a pair of grown up shoes with child shoes stuffed inside them like the worst tasting cannoli you can imagine. 2) Should have worn swim suits. The girls got progressively deeper into the pools until "why not? ", and just plopped in. They ended up drenched from head to toe. The weather was ideal for it though. Many of the stores outside the park entrance sold swimsuits, that should have tipped us off. We progressed up the white-to-rose colored (from algae, I think) slope, wading through blue-green pools that hid silt and/or sharp rocks on the bottom, hopping across slippery channels cut by quickly running water, and--when we had to--treading precariously over tiny ridges of nearly coral-like sharpness that were frequently submerged by an 1/8- to 1/4-inch of water while avoiding other tourists snapping selfies. This would be called a billabong in Australia. it takes to not include tourists in my photos. The temperature of the water was just fine (like bathwater) but you learned quickly which next step was (probably) going to hurt. Once we got to the top, we explored the ruins of Hieropolis and discovered that our elder daughter has a penchant for narrating videos. With a little luck (and preparation), our future family videos may also include a description of what we're looking at. While we were up on top of the highest exposed point in the immediate area, the dark clouds and drizzle from earlier in the day rolled back in. So we headed back down the slope...just in case the weather decided to turn on us. However, the trip down the travertine path was slightly more precarious than our ascent, since our 40+ pound 3-yr-old had fallen asleep in the ergobaby (again) during our stroll through the ruins. Remember how I said that we had to hop across slippery channels? Well, I didn't quite stick the landing on one of them...I scraped up the top of my bare foot as I rotated forward with the kid on my back as I landed on my hands and knees. But, in a true testament to my ninja-like skills, the kid stayed asleep on my back the whole time. I make a good pillow. The storm clouds opened up after we left the park. We had dinner at a local restaurant with a view of the white stuff, then we all retired to the room after a meandering walk around the town. One of the more interesting things we saw on our walk was a drainage channel full of crystal clear water lined with white calcium deposits. So, in theory, we could have done this all in one day and flown out wicked early tomorrow, but we've planned to spend one more day in the area. Now to figure out what to do tomorrow.